Ranger has been sick for the past week. I kept thinking it would get better, but it got worse instead. I will spare you the details. We went to the vet today. Not only is Ranger going to live, but I actually found something cheaper here, our vet bill! While waiting to see the vet, I was reminded that I am not the mom that I want to be. I'm not talking about grand ideas, like setting a positive example or teaching my child to read. I'm talking about the kind of organized mom, who always has toys, activities, and snacks to keep their child entertained. I did have a couple of boxes of raisins in my bag, but not one toy. I had diaper rash cream, kleenex, diapers, wipes, antibacterial wipes, lotion, a change of clothes, and even emergency hair bands. Ashlyn pulled all of these out of my bag, and my wallet, keys, and phone. I want to be that mom who always has everything needed, instead of giving her child her wallet, so she can play with her credit cards. In Alaska, Heather was always that mom. When we would go places with her family, she would even have snacks for Ashlyn, while I had nothing. Anyway, that is my next organizational goal. Somehow. I know that I am a loser, but this was the best day. After taking Ranger home, we grabbed lunch and went to post to get the mail! I knew that I had a package, since there was a notice this weekend. Ashlyn likes to go to the post office, too. She can turn the little knobs, and point out all the numbers. I even told her that as I was getting her out of the car, "I'll get the mail, and you can look at the numbers!" She gave a gasp of excitement over the prospect. She's way too easy to get excited over things right now. I'm not looking forward to the time when I'll actually have to come up with something cool for her to get excited, and then she'll just tell me how lame it is. But, digression, this was the mother load! We had seven packages! All of my fabric came, plus books that I had ordered, a gift for Ashlyn, and a fun package of goodies from Joy. All of this is great, but of course, I'm most excited about my fabric. So, I'm pushing aside the clothing that needs to be washed, and washing my fabric. I'm so excited that I can finally get started, once the fabric is washed, dried, and ironed. And, I guess I need to figure out where the iron is, since I haven't used it on clothes since we got here. I was going to post a picture of the fabric, then reconsidered that none of you cared, except maybe Laura, and posting pictures of fabric made me a total nerd. 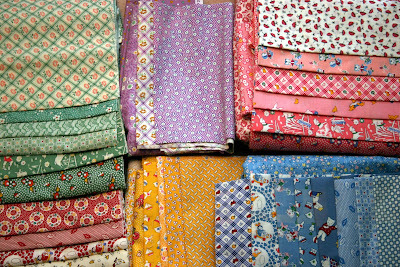 Then, I decided that it was my blog, and I AM a nerd, who is very excited about all of her fabric. I decided to go with some reproduction fabrics from the 20s and 30s. I love it! And, here's a picture of Ashlyn, for all those of you who are only here for those, anyway. 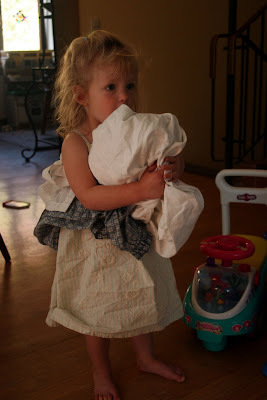 Ashlyn had taken Raggedy Ann's clothes off, and put them on herself. During her nap. I see that Ashlyn's still got her SHEET! I'd be willing to be that my granddaughter is the ONLY grandchild of all my friens....who has a SHEET instead of a "blankie"!! How unique we are!! Hey...your fabric looks really cute....what all are you going to make out of it....I know there's a quilt in mind....anything else? You didn't say what was wrong with Ranger....is he better today? 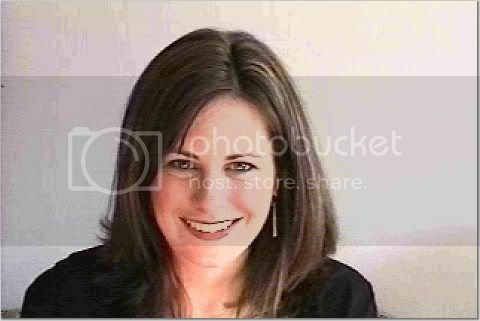 Although Michael and I do not have a blog we enjoy reading and keeping updated on how you and Allen and family are doing. I lived in Germany when my Dad was active and we really enjoyed our time there, it was such an experience, one that many never get a chance to see. Congrats on your soon to be. You look great! I on the other hand am about 5 weeks away from expecting our third and am so ready to be done. Michael and McKenzie are very excited and can't wait. Keep in touch. I'm so glad you put the fabric picture on there. It is SO cute. You have such a knack for picking stuff like that out--I cannot WAIT to see the finished product. What design are you doing? I had Becca pulling out all the credit cards from my wallet during church yesterday (the nursery worker was late) and then she got to my license, pointed to my picture and yelled "MOMMY!" about 50 times. Then we walked out of church. I TRY to be organized and have stuff for her, but she gets where she doesn't want ANYTHING I offer, so I have kind of quit trying. Mostly food will do it, anyway. Hope Ranger is OK! I am glad to hear the vet bills are cheaper there since he seems to have major medical issues. Of course he will probably be in great health until you PCS back to the states! Are you still cutting the sheet down? It looks pretty big still. Why don't you just keep a few pair of your underware in your bag? That seems to entertain Ashlyn and you have plenty. Love the fabric but I'm not good at visualizing things so I'm really looking forward to seeing the finished product. I love all the fabric! It looks like you have a couple projects in mind! Max has a backpack that he takes everywhere that has his crayons, paper, a book or 2 & a couple small cars & he knows he's responsible for it. He picked it out & we hang it on a peg by the front door. It only took a couple trips without it to get him to remember it before we left the house. Might work for Ashlyn. Sara has a brilliant idea. I am going to steal that. We even have a backpack I can commission for the task. Joy, Ranger wasn't better yesterday, that was why we took him to the vet. And, I'm still sparing the details on what was wrong. Bacteria overload or something. He can't eat for 24 hours, and is having a hard time with that. We'll see how he does when all he can eat is rice and cottage cheese for the next three days. Other Joy, I've got to email you and catch up! Katie, I'm making a floral quilt. And, I'm just planning a quilt. And, food is the only thing that works in church, because then their mouth is too full for talking. Vicki, We didn't cut the sheet down any further. It is a good size to still cover up right now, so we're leaving it. The backpack is a good idea, Sarah. Now, I just need to actually do it. Kim, don't hurt yourself, but I'm waiting to hear what you have to say about the stroller. I love love LOVE the fabric. Love the fabric, and the picture of Ash. Also. love the belly shots. I miss you!! I wish I could see you and your little belly grow. What does Ashlyn think of number 2?